The National Cotton Candy Day is celebrated on December 7. Cotton candy, also known as candy floss or fairy floss, is a confection that is almost 100 percent sugar. Cotton candy is made by heating sugar to liquify it and then spinning the sugar our through tiny holes. The sugar re-solidifies in thin strands which remind of glass. The final cotton candy is very light because it contains mostly air. Cotton candy was first created in Europe in the 18th century. At that time, it was very expensive because spun sugar had to be made manually. The dentist William Morrisson and confectioner John C. Wharton invented machine-spun cotton candy in 1897 thus making this confection generally available. The first automated cotton candy machine was created in 1972. 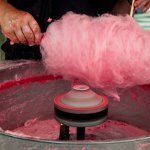 Cotton candy is a treat typically served at fairs, carnivals and fairs where it is sold in plastic bags or on paper batons. The natural color of cotton candy is white, but it can be changed with the help of food coloring. Cotton candy can also be flavored. The largest manufacturer of cotton candy in the United States is Tootsie Roll Industries. To celebrate the National Cotton Candy Day, treat yourself to some cotton candy. Just don't go overboard in order not to get sugar high.